The NBA is as evolving and as progressive in its changes than any league these days, and with the news of a plan to better the Mental Health of players with a NBA and NBPA run wellness program, the NBA is leading the charge as the best professionally ran league in North America. Just like how the NBA is continuing to grow off the court, it’s on the court that the NBA has been running wildfire with a more fast-paced move and shoot game. Point guards are shooting the ball more than they ever did, and with the inclusion of big men being more like small forwards in how they play while adding a three point shot of their own, the days of back down big men are all but dead and replaced by bigs who can do a little bit of everything. But in the days of Shaq, Tim Duncan and Kevin Garnett, it was a seven foot German transfer who was drafted 9th overall by the Milwaukee Bucks -who was then traded to the Mavs in a deal for Robert Traylor. It didn’t take long for the tall lanky German to stand out on the court, he was still backing dudes down in the post like any other big did in those days, but instead of turning for a hook shot or trying to muscle his way for a shot, Disco Dirk would instead fade away from the basket while one legged at times nothing but net. The magic and ease in which Nowitzki would be able to get that shot off over anyone in the NBA big or small was incredible, and helped him get to an impressive sophomore year when he improved his scoring from 8.2 PPG to nearly 20 points per game, and a lot of that had to do with the acquisition of Canadian stud Steve Nash, who the Mavericks got in a deal with the Phoenix Suns, and they formed a dangerous dynamic duo that would see Dirk really start to stretch out his game and become a dangerous three point shooter. As Dirk got older the NBA started to slightly change, and more bigs were able to expand their game. More guys were able to feel confident in the mid-range and did not heavily rely on having to be 3 inches from the rim with their backs turned. Guys like Chris Bosh came along and like Dirk, he relied on more of a first step to get to the rim, or if he couldn’t he would find a comfort zone in the mid-range area and pop in an easy shot, while also developing a solid post fade-away game and eventually a reliable three point shot. Years have passed though and the game of basketball has evolved into what Dirk Nowitzki was playing for years, and there hopefully has been a fill in for the eventually missing void left by Dirk’s retirement, whether that be after this season or whether he fills out his remaining year of his newly signed 2 year $10 million dollar deal he signed in the off-season, basketball fans and Knicks fans are hoping that fellow European star Kristaps Porzingis can help remind them of some of Dirks awesome traits. 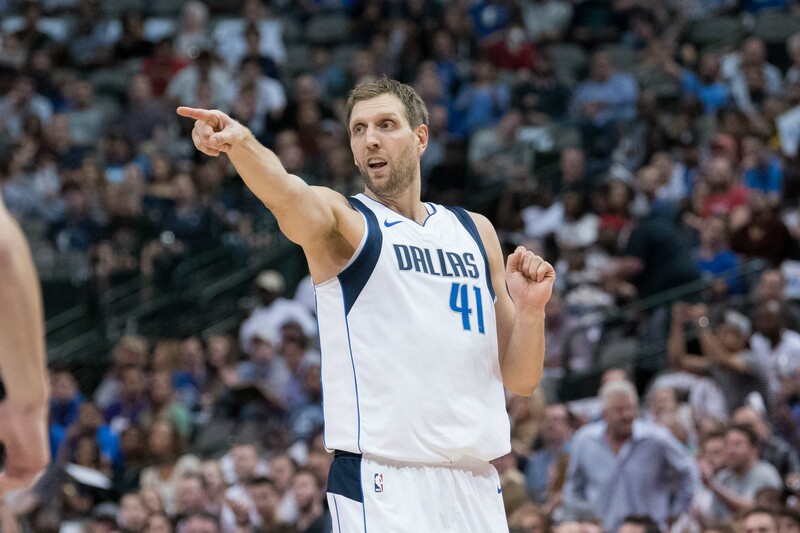 The NBA is more three point and ball moving reliant then it has ever been, and for Dirk Nowitzki who is just trying to hold on and go along with the ride, this shows that his way worked and that his footprint left on the NBA is one where it influences teams and players in an ever evolving and ever progressive, dynamic NBA.